Lensbaby has announced its Twist 60 lens, a 60mm f2.5 lens featuring a "striking separation between subjects and their background" with a "swirly blur and enhanced vignette." Twist 60. Canon, Nikon version [l] and Sony version. "Twist 60 embodies our love of old lenses and their unique ways of helping photographers discover creative possibilities," said Craig Strong, Lensbaby co-founder and chief creative officer. "True to an 1840 design by Joseph Petzval, this lens reveals striking separation between subjects and their background, a quality that modern lens designs lack." Swirling Background. Photo by Rachel Shomsky. The Twist 60 is designed for full frame cameras. A version compatible with the Optic Swap System will also be available. For best results, when using it in a tilting Lensbaby such as the Composer Pro, photographers should shoot with Twist 60 pointed straight ahead, the company said. The $279.95 Twist 60 lens will ship on May 5, the company said. Twist 60 Optic will also be sold separately for use with other Lensbaby Optic Swap System-compatible lenses for $179.95. Pre-orders are now being accepted by B&H and Adorama. PORTLAND, Ore. -- Lensbaby, makers of award-winning creative effects lenses, optics and accessories, today announced the availability of the Twist 60 lens. 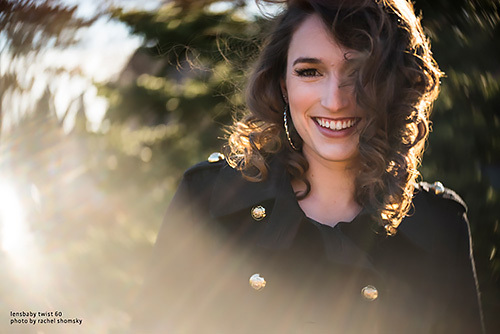 Twist 60 helps creative photographers find their visual voice by seeing the world differently. This metal-bodied 60mm f2.5 lens with gold anodized accents creates powerful portraits, spotlighting subjects by freeing them from their background and surrounding them with swirly blur and enhanced vignette. The brighter the aperture, the greater the swirl and the greater the vignette. "Twist 60 embodies our love of old lenses and their unique ways of helping photographers discover creative possibilities," said Craig Strong, Lensbaby Co-Founder & Chief Creative Officer. "True to an 1840 design by Joseph Petzval, this lens reveals striking separation between subjects and their background, a quality that modern lens designs lack." Twist 60 lens retails for $279.95 and is available via pre-order beginning April 12 (shipping May 5th). 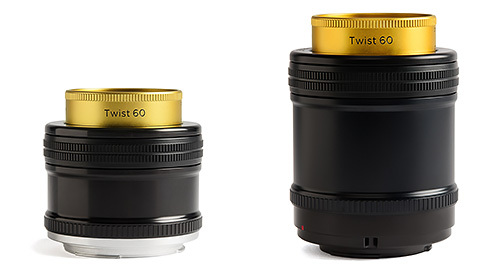 Twist 60 Optic will also be sold separately for use with other Lensbaby Optic Swap System-compatible lenses. It retails for $179.95. For best results, when using it in a tilting Lensbaby such as the Composer Pro, photographers should shoot with Twist 60 pointed straight ahead. Lensbaby products are available at lensbaby.com, B&H, Adorama and from select specialty photo stores worldwide.